Blizzard’s continued to preview some of the “gear sets” we’ll see in the Blizzcon demo. The third image, posted this afternoon, shows off the female Barbarian. The image is to the right, and here’s the announcement, from the Diablo FaceBook page. 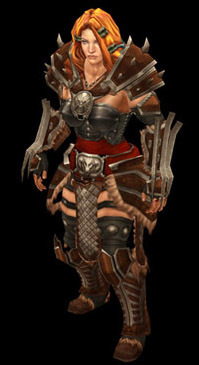 Our third (of six) armor preview continues with a behind-the-scenes look at the female barbarian. She stands ready to crush her enemies, see them driven before her, and hear the lamentation of their men. Enjoy! We’ll be back next Tuesday with a preview of gear on the female witch doctor. Note that this is not an Item Set, but a “gear set,” which just means a full outfit of items of equivalent level. This reflects nothing of the magical modifiers on the items; it’s more like these are all equivalent to low level plate mail, in terms of defense provided. We’ve heard in the past that there are 18 such levels of armor. Bashiok said this one is some wherein the middle; about what your wizard might be wearing by level 20. So what are the individual pieces of armor called, then? I mean, how do you name 18~ levels of armor without using leather, cloth, plate, chain, etc, for names? They had such names previously, but that means little as much as stuff changes during development. Or does @Diablo just mean that the different levels of “gear set” are not sorted by material names, while the individual items in them are, simply because they’ve got to be called something? Does anyone here think that the female barbarians face looks much more feminin than before? Perhaps this is why she has no helmet, to intentionally show us that. Both female and male barbarian have had pretty drastic make-overs since the original character renders back from announcement. All of the heroes from announcement have to one degree or another been gone over again since then, but I’d say the barbs are most noticeable as their actual faces were redone. Every Tuesday and Thursday leading up to BlizzCon on October 22 we’ll be sharing a behing-the-scenes sneak peek at a gear set that will be featured in the playable demo at the event. Please enjoy! No Monk gear sets, presumably since they’re not yet finalized them all for the most recently-revealed of the four characters? Blue: Why not more Diablo III Blizzcon Panels?